Among the Yombe people, masks were used in divination ceremonies, through which past or future events were revealed. This example was worn by a nganga diphomba, a divination specialist devoted primarily to the detection of members of the community responsible for various crimes, accidents, and other disasters. The diphomba prosecuted anti-social acts, and during a ritual trial functioned as the vehicle for the verdict of the ancestral spirit. Yombe masks are generally regarded as idealized representations of the diviners who wore them, but the closed eyes, parted lips, and overall expression of intense concentration on the Kimbell mask lend it a sense of heightened realism. 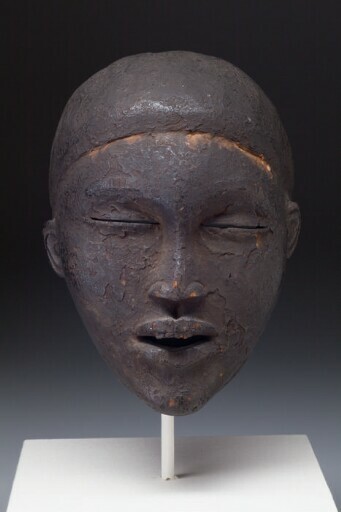 The mask’s crusted, black surface is the result of its having been stored in the rafters of a building where it was exposed to the oils and smokes of cooking. The black color of the mask is also associated with judgment and divination. Had it been reused, it would almost certainly have been cleaned and repainted as a part of its preparation for receiving the spirit. Some masks have relatively blank countenances and depend upon costume and context—dance, chant, and even speech—to create personality. Others, such as this Yombe mask, seem aglow with character.